This article is about the Simpsons character. For the play featuring the character, see Mr. Burns, a Post-Electric Play. For people with the surname, see Burns (surname). For other uses, see Burns (disambiguation). Charles Montgomery "Monty" Burns, usually referred to simply as Mr. Burns, is a recurring character of the animated television series The Simpsons. He is voiced by Harry Shearer. He is the evil, greedy and wealthy owner of the Springfield Nuclear Power Plant and is also Homer Simpson's boss. He is assisted at almost all times by Waylon Smithers, his loyal and sycophantic aide, adviser, confidant, and secret admirer. Although originally conceived as a one-dimensional, recurring villain who might occasionally enter the Simpsons' lives and wreak some sort of havoc, Mr. Burns' popularity has led to his repeated inclusion in episodes. He is a stereotype of corporate America in his unquenchable desire to increase his own wealth and power, inability to remember his employees' names (including Homer's, despite frequent interactions – which has become a recurrent joke) and lack of concern for their safety and well-being. Reflecting his advanced age, Mr. Burns is given to expressing dated humor, making references to Jazz Age popular culture, and aspiring to apply obsolete technology to everyday life. Conan O'Brien has called Mr. Burns his favorite character to write for, due to his arbitrarily old age and extreme wealth. Mr. Burns' trademark expression is the word "Excellent", muttered slowly in a low, sinister voice while steepling his fingertips. He occasionally orders Smithers to "release the hounds", so as to let his vicious guard dogs attack any intruders, enemies or even invited guests. Mr. Burns is Springfield's richest and most powerful citizen (and also the richest person in Springfield's state; his current net worth has been given as $7.3 billion by Forbes, though it fluctuates wildly depending on the episode). He uses his power and wealth to do whatever he wants, usually without regard for consequences and without interference from the authorities. These qualities led Wizard Magazine to rate him the 45th greatest villain of all time. TV Guide named him #2 in their 2013 list of The 60 Nastiest Villains of All Time. In 2016, Rolling Stone ranked him #8 of their "40 Greatest TV Villains of All Time". As the primary antagonist, Mr. Burns spends his time in his office at the nuclear plant, monitoring his workers via closed-circuit cameras. At an early age, Mr. Burns left his family to live with a twisted and heartless billionaire who owned an "atom mill" in Shelbyville. He lived a life of privilege and would amuse himself by injuring immigrant laborers. Mr. Burns later attended Yale University, where he studied science and business, joined Skull and Bones, competed in the "etherweight" wrestling class, and graduated in the class of 1914. At his 25-year college reunion, he became romantically involved with the daughter of an old flame. She would later bear his child, Larry Burns, who was given up for adoption and would later enter Mr. Burns' life briefly. Mr. Burns has been engaged at least three times: to a woman named Gertrude who died of loneliness and rabies, to Marge Simpson's mother Jacqueline Bouvier, and to a meter maid named Gloria. Mr. Burns enlisted in the United States Army during World War II, and served as a member of Springfield's Flying Hellfish squad under Master Sergeant Abraham Simpson and saw action in the Ardennes during the Battle of the Bulge. Later on he was shipped to the Pacific Theater and was a co-pilot along with Abe Simpson and his brother, Cyrus. Mr. Burns and Abe were shot down by a kamikaze and stuck on an island. At the end of World War II he was personally hired by President Harry S. Truman to transport a specially-printed trillion dollar bill to Europe as the United States' contribution to the reconstruction of Europe. As the United States' richest citizen, Mr. Burns was thought to be the most trustworthy. Mr. Burns absconded with the bill and kept it in his possession for many years until it was lost to Fidel Castro in "The Trouble with Trillions". In "Homer the Smithers", it is revealed that Mr. Burns' mother is still alive at the age of 122 years, although Mr. Burns dislikes speaking to her, because she had an affair with President William Howard Taft and she refers to him as an "improvident lackwit". Furthermore, because she is so old, the only things she can do (according to Smithers) are pick up the phone, dial and yell. Mr. Burns resides in a vast, ornate mansion on an immense estate called Burns Manor, on the corner of Mammon and Croesus Streets. It is protected by a high wall, an electrified fence, and a pack of vicious attack dogs known as "The Hounds". Mr. Burns routinely subjects Springfield and its residents to his abuse and there is a general dislike of him throughout the town. Mr. Burns has blackmailed and bribed various officials in Springfield, including Mayor Quimby and its nuclear safety inspectors. He employed his wealth to make an ultimately unsuccessful run for governor, only to be denied his chance to be Governor by Marge Simpson. He once blocked out the sun to force Springfield residents to increase their use of electricity produced by his nuclear plant and was subsequently shot by Maggie. Mr. Burns' state of mind is the subject of frequent jokes on the show. At times, he appears to be completely removed from reality and modern conventions. He continually fails to recognize Homer Simpson or remember his name, even though many of the recent major events in Mr. Burns' life have involved Homer in some way. Mr. Burns is, for the most part, unaware of the townspeople's general dislike of him. He also displays mannerisms which are considered outdated, such as practicing phrenology, writing with a quill pen, and using an antique view camera to take photographs. He is also angered when Springfield Elementary children mock his dated car, saying it was "the first car to outrun a man!" Mr. Burns refers to many celebrities of the late 19th and early 20th centuries in the present tense, assuming they are still alive. In "Homer at the Bat", Mr. Burns instructs Smithers to recruit dead-ball era players, such as Honus Wagner and Cap Anson for the plant's softball team, and has to be told that all of them died long ago. He also once rewarded Homer for being the first to arrive at work with a ticket to the 1939 World's Fair. However, despite his obvious senility and social ineptitude, Mr. Burns is an extraordinarily clever businessman, as he has lost his fortune several times, only to regain it a very brief time later. In the episode "The Old Man and Lisa", Mr. Burns loses his fortune and regains it by opening a recycling plant, which allows him to regain his nuclear power plant. Additionally, in the episode "The Seemingly Never-Ending Story", Mr. Burns loses both his fortune and nuclear power plant to the Rich Texan after losing a scavenger hunt, but eventually gains both back after a series of events that includes him briefly working at Moe's Tavern. Mr. Burns is physically weak and often shown to have little more strength than an infant. In the intro of "The Simpsons Movie", Mr. Burns is seen in his bathroom trying to brush his teeth. After Smithers applies the toothpaste onto his brush, he falls over. In "Rosebud" and "Who Shot Mr. Burns? ", he needed a great deal of effort to wrench items from Maggie. He has difficulty performing such simple actions as giving a thumbs-up, and crushing an insect by stepping on it, or using a door-knocker. In one instance, when he is told to jump out of his burning mansion onto a life net, he drops at the speed of a feather and floats onto some power lines and is electrified. He pitched the opening baseball at a game in "Dancin' Homer", but was only able to throw it a small distance, which drew mocking laughter from the crowd. When Mr. Burns joined Homer's bowling team in "Team Homer", he was barely able to roll the ball down the lane. In season five's "Burns' Heir", Smithers puts a sponge on Mr. Burns' head before leaving the bathroom, causing him to nearly drown in the tub from its weight. In "Lady Bouvier's Lover" however, he shows himself as a lively, excellent dancer. Mr. Burns also had a teddy bear named "Bobo" that he loved as a child, revealed in the episode "Rosebud". The stuffed animal was lost and eventually, the stuffed bear became a toy for Maggie. In "American History X-cellent", Mr. Burns gets sent to jail because he is in possession of stolen paintings. In the same episode, it is implied that he was once in the SS. Another episode has him exclaim that though he and Oskar Schindler had much in common: "We both made shells for the Nazis, but mine worked, damn it!" The $2,000 "First Annual Montgomery Burns Award for Outstanding Achievement in the Field of Excellence", as a way to convince Homer not to file a lawsuit for nuclear-plant-induced infertility, was featured in the unofficial third-season finale, "Brother, Can You Spare Two Dimes?" Mr. Burns' character, appearance, and mannerisms are based on several different people. The show's creator Matt Groening principally based Mr. Burns on his high school teacher Mr. Bailey. Drawing further inspiration from oil tycoon John D. Rockefeller, David Rockefeller, Groening made Mr. Burns the "embodiment of corporate greed". Animator David Silverman parodied Mr. Burns' appearance on Fox founder Barry Diller, and modeled his body on a praying mantis. The idea of Mr. Burns reading employee names off cards in "There's No Disgrace Like Home" came from an article about Ronald Reagan that writer Al Jean had read. In some episodes, parallels have been drawn between Mr. Burns and moguls such as Howard Hughes and, more frequently, fictional character Charles Foster Kane from Citizen Kane. Writer George Meyer lifted Mr. Burns' "Excellent!" hand gesture from his former Saturday Night Live colleague Jim Downey. 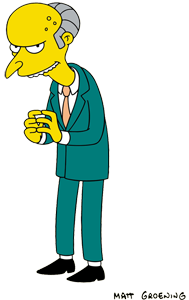 While perhaps not intentional, Mr. Burns' physical characteristics and mannerisms are cited as a modern example of the Commedia dell'arte character Pantalone. Matt Groening got Mr. Burns' middle name from a Montgomery Ward department store in Portland, Oregon's Northwest Industrial district and his surname from Burnside Street, a main thoroughfare in Portland. Mr. Burns' first name being Charles is a reference to Charles Foster Kane. In the script for "There's No Disgrace Like Home", Al Jean and Mike Reiss referred to him as "Mr. Meanie". In the second season, the writers started to enjoy writing about Smithers and Mr. Burns' relationship, and they often pitched episodes with them as the focus, but many never came to fruition. Harry Shearer modeled his voice for Mr. Burns on Lionel Barrymore and Ronald Reagan. Mr. Burns was originally voiced by actor Christopher Collins in the episodes "Simpsons Roasting on an Open Fire", "Homer's Odyssey", There's No Disgrace Like Home and "The Telltale Head". He was soon replaced by Harry Shearer because Sam Simon found him "difficult to work with". Shearer has voiced the character ever since. He modeled the voice on Lionel Barrymore and Ronald Reagan. Shearer is also the voice of Smithers and is able to perform dialogue between the two characters in one take. Shearer said that Mr. Burns is the most difficult character for him to voice because it is rough on his vocal cords and he often needs to drink tea and honey to soothe his voice. He describes Mr. Burns as his favorite character, saying he "like[s] Mr. Burns because he is pure evil. A lot of evil people make the mistake of diluting it. Never adulterate your evil." In 2014, Shearer won a Primetime Emmy Award for Outstanding Voice-Over Performance for his performance on "Four Regrettings and a Funeral" for voicing Mr. Burns. In 2006, Wizard magazine rated Mr. Burns the 45th greatest villain of all time. They also described Smithers and Mr. Burns as being "TV's most functional dysfunctional couple". In a 2003 article, EW also named "Last Exit to Springfield" the greatest episode of The Simpsons. Other episodes which feature Mr. Burns placed on the list, including "Rosebud", at number two, and the "Who Shot Mr. Burns?" two-part episode, at number 25. Vanity Fair placed "Rosebud" first on their list of the top 25 The Simpsons episodes. Forbes estimates Mr. Burns' net worth at $1.3 billion, placing 12th on the 2008 Forbes Fictional 15 list. Mr. Burns has been on the list since 1989 and has previously placed fifth in 2005, second in 2006 and sixth in 2007 when he was estimated to be worth $16.8 billion. Mr. Burns' evil has made him a popular example of terrible television bosses. In 2006, outplacement firm Challenger, Gray & Christmas released a report saying that Mr. Burns was one of the eight worst bosses on television. The News & Observer named Mr. Burns the third worst boss, calling him "heartless, greedy and exceptionally ugly, Mr. Burns makes Ebenezer Scrooge seem downright lovely." In the run-up to the New York City's 2009 mayoral election, several posters appeared throughout the city, showing Mr. Burns and accompanied by the words "No Third Terms, Vote for Burns" – a reference to Mayor Michael Bloomberg's run for a third term that year—in the style of Shepard Fairey's Obama poster. The city's Board of Elections announced that December that Mr. Burns had received 27 write-in votes out of 299 write-in votes cast. As the chief of "Springfield Republican Party" Mr. Burns endorsed Mitt Romney in 2012 US Presidential Election. The IG Group, a financial corporation in the City of London, use a recording of Mr. Burns' catchphrase "Excellent" as an alert that an order has been completed. ^ "In Pictures: The Forbes Fictional 15". Forbes. Archived from the original on 2010-04-17. ^ Bretts, Bruce; Roush, Matt; (March 25, 2013). "Baddies to the Bone: The 60 nastiest villains of all time". TV Guide. pp. 14 – 15. ^ Swartzwelder, John; Archer, Wes (1993-10-21). "Rosebud". The Simpsons. Season 05. Episode 04. Fox. ^ Oakley, Bill; Weinstein, Josh; Archer, Wes (1993-12-16). "$pringfield (Or, How I Learned to Stop Worrying and Love Legalized Gambling)". The Simpsons. Season 05. Episode 10. Fox. ^ Maxtone-Graham, Ian; Reardon, Jim (1996-11-17). "Burns, Baby Burns". The Simpsons. Season 08. Episode 04. Fox. ^ Gould, Dana; Anderson, Mike B. (2003-03-16). "C.E. D'oh". The Simpsons. Season 14. Episode 15. Fox. ^ Oakley, Bill; Weinstein, Josh; Archer, Wes (1994-05-12). "Lady Bouvier's Lover". The Simpsons. Season 05. Episode 21. Fox. ^ Swartzwelder, John; Kramer, Lance (2001-12-02). "A Hunka Hunka Burns in Love". The Simpsons. Season 09. Episode 08. Fox. ^ Collier, Jonathan; Lynch, Jeffrey (1996-04-28). "Raging Abe Simpson and His Grumbling Grandson in 'The Curse of the Flying Hellfish'". The Simpsons. Season 07. Episode 22. Fox. ^ Oakley, Bill; Weinstein, Josh (1995-05-21). "Who Shot Mr. Burns?". The Simpsons. Season 06. Episode 25. Fox. ^ Swartzwelder, John; Polcino, Michael (2000-01-23). "The Mansion Family". The Simpsons. Season 11. Episode 12. Fox. ^ Swartzwelder, John; Kirkland, Mark (1997-04-20). "The Old Man and the Lisa". The Simpsons. Season 08. Episode 21. Fox. ^ a b c d e Joe Rhodes (2000-10-21). "Flash! 24 Simpsons Stars Reveal Themselves". TV Guide. ^ Paterson, Billy (2006-08-20). "Exclusive: I Was Monty's Double". The Sunday Mail. Retrieved 2007-08-18. ^ a b Reiss, Mike (2001). Commentary for "There's No Disgrace Like Home", in The Simpsons: The Complete First Season [DVD]. 20th Century Fox. ^ Turner 2004, pp. 160–164. ^ Meyer, George (2001). Commentary for "The Crepes of Wrath", in The Simpsons: The Complete First Season [DVD]. 20th Century Fox. ^ "Places of character". The Portland Tribune. 2002-07-19. Archived from the original on 2009-03-04. Retrieved 2007-08-18. ^ Vitti, Jon (2002). Commentary for "Simpson and Delilah", in The Simpsons: The Complete Second Season [DVD]. 20th Century Fox. ^ a b Keith Marder (1994-04-28). "Real People are Models for 'Simpsons' Voices". Times Union. p. C4. ^ "Chris Latta". IMDb. Retrieved 2007-11-19. ^ Jean, Al (2002). Commentary for "Blood Feud", in The Simpsons: The Complete Second Season [DVD]. 20th Century Fox. ^ Earl Dittman (July 2007). "Burns, Baby, Burns". Cineplex. Archived from the original on 2008-05-07. Retrieved 2008-05-05. ^ Round, Simon (2008-10-10). "Interview: Harry Shearer". The Jewish Chronicle. Retrieved 2008-11-04. ^ Day, Patrick Kevin, "Harry Shearer becomes final 'Simpsons' main cast member to win Emmy", Los Angeles Times, August 18, 2014. ^ a b "The Family Dynamic". Entertainment Weekly. 2003-01-29. Retrieved 2007-10-25. ^ John Orvted (2007-07-05). "Springfield's Best". Vanity Fair. Retrieved 2008-11-03. ^ Noer, Michael; Ewalt, David M (2008-12-18). "No. 13 Burns, C. Montgomery". Forbes Fictional 15. Archived from the original on 2008-12-24. Retrieved 2008-12-21. ^ Ewalt, David M. (2005). "The Forbes Fictional 15". Forbes. Retrieved 2008-04-28. ^ Ewalt, David M. (2006-11-20). "The Forbes Fictional 15". Forbes. Retrieved 2008-04-28. ^ Ewalt, David M.; Michael Noer (2007-11-12). "The Forbes Fictional 15". Forbes. Retrieved 2008-04-28. ^ "Worst bosses ever ... on TV". CNN. 2006-08-21. Retrieved 2008-11-04. ^ "Worst bosses ever ... on TV". The News & Observer. McClatchy Newspapers. 2008-10-12. Archived from the original on October 17, 2008. Retrieved 2008-11-04. ^ de Sola, David (2009-12-05). "Simpsons billionaire gets most write-in votes in NYC mayor race". CNN. Retrieved 2009-12-06. ^ Day, Patrick Kevin (2012-11-01). ""The Simpsons" Mr. Burns endorses Mitt Romney". Los Angeles Times. Retrieved 2015-06-30. ^ "City firm follows Budget with a little help from The Simpsons". BBC. 2015-03-19. Retrieved 2015-03-19.